Archie Hunter began playing for Aston Villa in 1878. He commented that it was not unusual for men to die as a result of playing football. He wrote: "He (Yates) caught a severe cold on the field and died within a few days. That is how so many players collapse. They play in all sorts of weather during the most inclement part of the year; in the struggle they get tremendously hot and if there are not proper provisions for changing their clothes and having a bath, they run the most fearful risk." Hunter himself suffered a heart-attack while playing a game on 4th January, 1890. He was forced to retire from the game but died soon afterwards at the age of 35. Several players have died as a direct result of injuries sustained while playing football. In 1892 James Dunlop of St Mirren died of tetanus as a result of a cut received in a match. A report published by The Lancet on 24th March 1894 pointed out the dangers of playing football. The doctor who wrote the article warned about the the practice of charging a man trying to head a football: "To smash cruelly into him and knock him over unnecessarily and perhaps savagely is clearly a brutality and perhaps savagely is clearly a brutality which is permitted by the rules." On 23rd November 1896, Joseph Powell of Arsenal went to kick a high ball during a game against Kettering Town. His foot caught on the shoulder of an opponent and Powell fell and broke his arm. One of the men who went to his aid fainted at the sight of the protruding bone. Infection set in and, despite amputation above the elbow, Powell died a few days later when just twenty-six years of age. The Lancet continued to record details of these incidents and in an article published on 22nd April 1899 that over the last eight years around 96 men had died while playing football and rugby. It was unusual in the 19th century for footballers to die early deaths. Nick Ross was still playing for Preston North End when he died of consumption in 1894. The English international, Tom Bradshaw, died of the same disease on Christmas Day 1899. However, one close friend was convinced that he died as a result of a kick to the head he had received while playing for Liverpool. Bradshaw complained that he suffered terrible pains when he headed the ball. Bradshaw, who was only 26 years old, left a widow and two young children. In a pre-season public practice game in 1902, Di Jones, who played for Manchester City, gashed his knee. Despite treatment from the club doctor, within a week the wound had turned septic and the player died. In April 1907 Thomas Blackstock collapsed after heading a ball during a reserve game against St. Helens Town. Frank Buckley, who was standing nearby, helped to carry Bradstock, who was only 25 years old to the changing-room. Blackstock died soon afterwards. An inquest into his death returned a verdict of "Natural Causes" but Buckley believed he had died of a heart-attack or seizure. Several players at the club were angry about the way Blackstock's family was treated after his death. Billy Meredith, Charlie Roberts, Charlie Sagar, Herbert Burgess and Sandy Turnbull, decided to form a new Players' Union. The first meeting was held on 2nd December, 1907, at the Imperial Hotel, Manchester and the Association Football Players Union (AFPU) was established. Blackstock only played in three first-team games in the 1906-07. In April 1907 Blackstock collapsed after heading a ball during a reserve game against St. Helens Town. Frank Buckley, who was standing nearby, helped to carry him to the changing-room. Blackstock died soon afterwards. An inquest into his death returned a verdict of "Natural Causes" but Buckley believed he had died of a heart-attack or seizure. In 1909 James Milne of Hibernian died from internal injuries sustained in a game in the Scottish League. When Frank Levick of Sheffield United died aged 26 in 1908, the AFPU sent his family £20. They also entered into negotiations with his club about the compensation to be paid to his wife. The AFPU also explored the ways that football players could make use of the Workman's Compensation Act (1906). The England international, Bob Benson, worked in a munitions factory in London during the war. 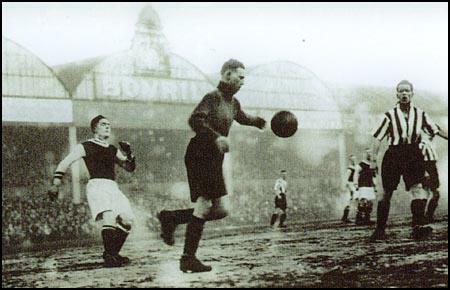 On 19th February 1916, Benson went to watch Arsenal play Reading. Arsenal's right-back, Joe Shaw, could not get away from his job and so Benson, who had not played for a year, agreed to take his place in the team. Clearly unfit, Benson was forced to retire from the field feeling unwell. He tragically died in the dressing-room in the arms of the Arsenal trainer, George Hardy. It was later discovered that he had died of a burst blood vessel. Benson was buried in his Arsenal shirt. Others who died during games or as a direct result of injuries include Tom Butler (Port Vale, 1923) and Sam Wynne (Bury, 1928). On 5th September, 1931, Celtic played Rangers in front of an 80,000 crowd at Ibrox Stadium in Glasgow. 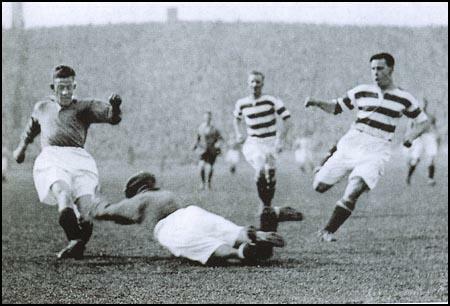 Early in the second half Sam English raced through the Celtic defence and looked certain to score, when Celtic's international goalkeeper, John Thomson dived at his feet. Thomson's head collided with English's knee and he was taken unconscious from the field. According to The Scotsman, Thomson "was seen to rise on the stretcher and look towards the goal and the spot where the accident happened". John Thomson diving at the feet of Sam English on 5th September, 1931. John Thomson was taken to the Victoria Infirmary but he had fractured his skull and he died at 9.25 that evening. He was 22 years old. Over 40,000 people attended the funeral in Cardenden, including thousands who had travelled through from Glasgow, many walking the 55 miles to the Fife village. In 1934 Simon Raleigh of Gillingham died from a brain haemorrhage following a clash of heads with Brighton's Paul Mooney. The Brighton player was so distressed by Raleigh's death that he retired from playing football. The following year, Jimmy Utterson, who played as a goalkeeper for Wolverhampton Wanderers, died from head injuries he had received in a game against Middlesbrough. On 1st February 1936, Sunderland played Chelsea at Roker Park. According to newspaper reports it was a particularly ill-tempered game and Chelsea's Billy Mitchell, the Northern Ireland international wing-half, was sent off. The visiting forwards appeared to be targeting the Sunderland goalkeeper, Jimmy Thorpe, who took a terrible battering during the match. Sunderland took a 3-1 lead but Chelsea fought back and Joe Bambrick, scored with a shot outside the area. A few minutes later, with Bambrick rushing in at full speed, Jimmy Thorpe misjudged a back-pass and allowed it to run over his arm. Bambrick continued his run and had an easy tap in to make it 3-3. One newspaper reported that "atrocious goalkeeping cost Sunderland a point". As a result of the battering he had received, Jimmy Thorpe was admitted to the local Monkwearmouth and Southwick Hospital suffering from broken ribs and a badly bruised head. Thorpe had also suffered a recurrence of a diabetic condition that he had been treated for two years earlier. Thorpe died of diabetes mellitus and heart failure on 9th February, 1936. Thorpe, who was only 22 years old, left a wife and young son. In the Walsall Swifts I should single out Yates for mention, a grand half-back, clever in tackling and always displaying excellent judgment in feeding his forwards. Poor fellow! He caught a severe cold on the field and died within a few days. That is how so many players collapse. They play in all sorts of weather during the most inclement part of the year; in the struggle they get tremendously hot and if there are not proper provisions for changing their clothes and having a bath, they run the most fearful risk. In my opinion the first attention of clubs should be directed to this matter and baths ought to be regarded as an indispensable part of the arrangements. I have known many a gallant and promising player die within a week of 'playing a match simply because of inattention to these precautions. it is folly almost amounting to crime to neglect this matter. But this is by the way. I did not know it then, my career as a footballer was rapidly coming to an end. I broke down while playing Everton the following season. The ground was in a fearful condition after heavy rain. Pools of water and masses of mud made play almost impossible and to add to our troubles a biting east wind was cutting us and seemed to pierce us like a knife. I was playing my hardest when I fell into a pool of water. Just before I had received a severe bruise and with the additional shock to the system I fainted away. On reaching home I was advised to relinquish play and that advice I have taken. More than 80,000 were at Ibrox to witness an event that has remained imprinted on the Scottish football psyche ever since. With the second half barely five minutes old, Rangers striker Sam English broke free and lined up to shoot from near the penalty spot. 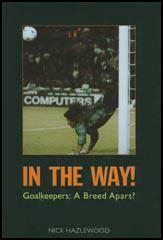 He seemed certain to score, when Thomson launched one of his do-or-die head-first saves at the attacker's feet. It was Thomson's trademark save - in February 1930 against Airdrie he'd been injured doing exactly the same thing, fracturing his jaw and injuring his ribs. This time there was an even more sickening crunch, Thomson's head colliding with English's knee at the moment of greatest impact. It was no longer a do-or-die moment, it was a do-and-die. The ball ran out of play, English fell to the ground and rose limping, Thomson lay unconscious, blood seeping into the pitch. What followed was an outpouring of public grief that, it is said, briefly united communities across the sectarian divide. In Bridgeton, Glasgow, traffic was brought to a halt by thousands of pedestrians walking past a floral tribute to Thomson, placed in a shop window by the local Rangers supporters club. And at Glasgow's Trinity Congregational Church there were unruly scenes when thousands struggled to get into Thomson's memorial service. Women screamed with alarm at the crush and only swift action by police cleared a passageway and stemmed the rush. Celtic right-half Peter Wilson, who was due to read a lesson, failed to gain entrance and found himself stranded outside the church for the ceremony. Tens of thousands went to Queen Street station to see the coffin off on its train journey home to Fife. Many thousands more made the same journey: by train, by car and by foot. Unemployed workers walked the 55 miles, spending the night on the Craigs, a group of hills behind Auchterderran. In Fife, local pits closed down for the day and it seemed as if the whole of Scotland had swelled the small streets of Cardenden. Thomson's coffin, topped by one of his international caps and a wreath in the design of an empty goal, was carried by six Celtic players the mile from his home to Bowhill cemetery, where he was laid to rest in the sad and quiet graveyard populated by the victims of many, many mining disasters. 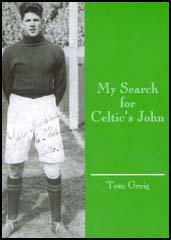 Among the galaxy of talented goalkeepers whom Celtic have had, the late lamented John Thomson was the greatest. A Fifeshire friend recommended him to the Club. We watched him play. We were impressed so much that we signed him when he was still in his teens. That was in 1926. Next year he became our regular goalkeeper, and was soon regarded as one of the finest goalkeepers in the country. But, alas, his career was to be short. In September, 1931, playing against Rangers at Ibrox Park, he met with a fatal accident. Yet he had played long enough to gain the highest honours football had to give. A most likeable lad, modest and unassuming, he was popular wherever he went. His merit as a goalkeeper shone superbly in his play. Never was there a keeper who caught and held the fastest shots with such grace and ease. In all he did there was the balance and beauty of movement wonderful to watch. Among the great Celts who have passed over, he has an honoured place.